As a non-profit, non-stock educational foundation, AUF depends largely on the generosity of benefactors for various expansion projects. Over the years, it has received substantial financial assistance from benefactors in Europe, Asia and the United States. For this purpose, the Angeles University Development Foundation was established on November 29, 1984 to provide management and financial support to both AUF and the AUF Medical Center. Currently based in Virginia, it was granted recognition by the US Treasury Department on August 23, 1985 to receive donations and was exempted from the payment of federal taxes. AUDF was instrumental in acquiring for AUF financial grants from USAID through the American Schools and Hospitals Abroad (ASHA) for the construction of the AUF Our Lady of Lourdes Library Hall and the AUF Information Technology Training Center (ITTC). It was also instrumental in obtaining hospital equipment and furniture for AUFMC from the St. Anthony Family Medical Center in Milwaukee and the following hospitals in California: Cedars-Sinai Medical Center, Brookside Hospital, Robert F. Kennedy Medical Center, Sierra Madre Memorial Hospital, Tracy Community Memorial Hospital, Mayers Memorial Hospital, Children's Medical Center of Northern California, Kaiser North Hospitals, Kaiser South Hospitals, and the Queen of Angels Hollywood Presbyterian Hospital. The AUF Information Technology Center is a joint project of AUDF and ASHA-USAID. 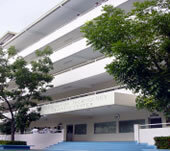 Inaugurated on September 5, 2000, this modern facility has brought AUF to the forefront of IT education. The AUF Our Lady of Lourdes Hall was constructed also through the generous support of ASHA-USAID. This spacious and full air-conditioned library facility which is home to 56, 641 titles ( in 73, 719 volumes) of print materials and 12, 506 on-line library resources, was inaugurated on December 4, 1987.